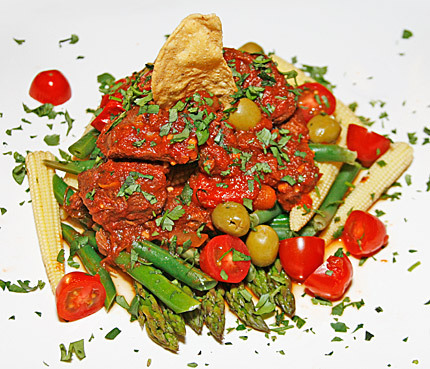 A slow-cooked beef chili with the accent on tomatoes, and finished with fresh vegetables. Serve it with kidney beans and rice if you must, but I much prefer a bed of green beans, fresh baby corn, asparagus or other veggies. This recipe just fits a 4 quart slow cooker. Time: About 8 hours, mostly unattended. Heat a large frying pan with 1 tablespoon of olive oil coating the pan. Add the beef chuck and stir while the beef browns on medium to high heat. 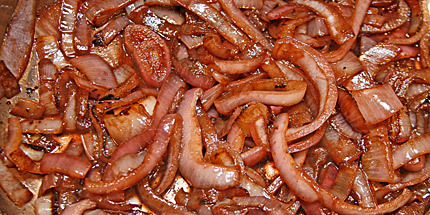 Sprinkle a small amount of soy sauce on the meat from time to time, to add flavor and aid in the browning. Place the browned meat in the slow cooker, and de-glaze the pan with .5 cup red wine. Make sure to get as much pan browning as possible as you de-glaze, to capture all that flavor. Wipe out and re-heat the pan, add more olive oil, and add the sliced red onion. Heat until the onions are browned, about 5 minutes on medium heat, and de-glaze again with another .5 cup red wine. Add the onions and wine to the slow cooker. Push a fork into the stem end of each red pepper. 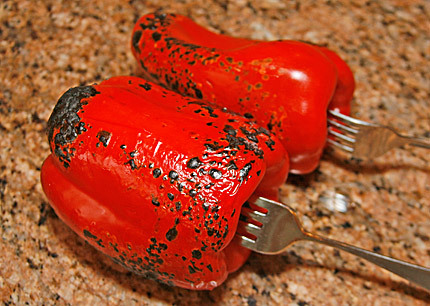 Roast the pepper over a burner (ideally a gas burner) until the pepper skin begins to blacken (see photo below). Allow the peppers to cool enough to handle them. Clean out the inside seeds and pith of the red peppers, and rough-chop them, leaving the skin intact on the pieces. Add the pepper pieces to the slow cooker. Slice the jalapeno pepper into circles that include the interior pith and seeds. Place the pepper slices into the slow cooker. Add all of the spices and the fresh salsa into the cooker. 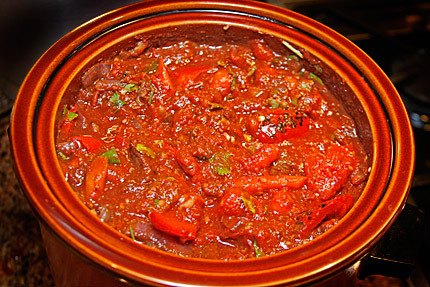 Add the entire contents of the the plum tomato can (all liquid and the tomatoes) into the slow cooker. Stir all the ingredients to mix thoroughly. How you set the slow cooker depends on your schedule. If you have a full 8 hours, set the cooker on the low temperature. If you only have 4-6 hours, put the cooker on high and stir about once an hour. The longer you slow-cook the chili, the more tender and flavorful the beef will be, so don’t try to rush this meal or you’ll get tough, stringy beef. Place the green beans, baby corn, and asparagus into a steamer basket in a 6-quart (or other suitable) covered pan and steam about 4-5 minutes until the vegetables are just done, but still firm. Plate the vegetables for each serving in the center of each dish, then spoon the chili sauce and beef chunks over the vegetables. Finish by scattering tablespoon of fresh salsa over each portion, and scattering the olives and grape tomatoes over the pile. Sprinkle with the remaining chopped cilantro and serve. 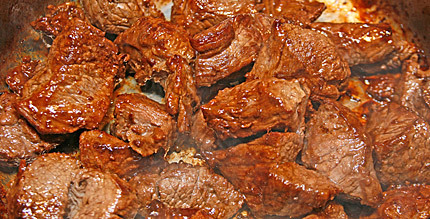 Thoroughly browning the beef enhances the flavor of any chili or beef stew. Sprinkle sparingly with soy sauce to enhance the browning. The browned onions, de-glazed with a half a cup of red wine. This is a fast, easy way to produce roasted red peppers, particularly on a gas range. All ingredients combined into the slow cooker. A lighter, healthier alternative to the usual styles of chili.